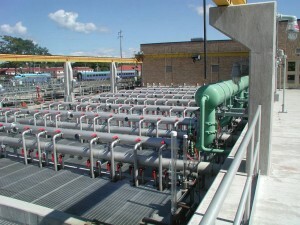 Traverse City, Mich., wastewater treatment plant has membrane filtration. The emerging threat of pharmaceuticals, everyday chemicals and personal care products in drinking water may be the most difficult that water treatment plants have faced. Lake Michigan takes 99 years to “turn over,” meaning chemicals that entered the lake a century ago may only just be exiting, the Alliance for the Great Lakes reported just this week. The report says that surface water in Lake Michigan contains six of 20 “priority” chemicals, or emerging contaminants identified by environmental engineers from Michigan State University. They include flame retardants and a cholesterol-lowering drug. After treatment, only a fire retardant remained in ready-to-drink water. Experts say that membrane bioreactors may remove some pharmaceuticals while treating wastewater, but they cannot catch all of the diverse medicines. There are 35 treatment plants in the Great Lakes region that use such membrane technology: 14 on Lake Michigan, 13 on Lake Huron, five on Lake Superior, two on Lake Erie and one on Lake Ontario, according to Siemens Water Technologies, a company that constructs the membranes. One in Traverse City, Mich., was the largest in the nation when it opened in 2004. It serves 45,000 people in the city and surrounding area. It took more than two and half years and approximately $31 million to upgrade an old plant deemed too small for a growing population. A forum for public comment identified two goals: make use of the existing plant in some way and exceed federal water requirements, said Scott Blair, the manager of the Traverse City wastewater treatment plant. A membrane bioreactor plant was chosen as the ideal upgrade. This kind of plant uses a membrane that passes through treated water to remove debris, contaminants, bacteria and potentially some pharmaceuticals. However, the membrane itself cannot filter all pharmaceuticals, because there are so many different kinds, said Blair. Large molecules, including bacteria, cannot pass through the membrane, but different medicines have different size molecules. That means some pass through. The water is run through “activated sludge” that forms clumps of bacteria called “floc.” Some pharmaceuticals also degrade and attach themselves to the sticky blobs. They are then filtered out by the membrane. Pharmaceuticals in water have recently come under attention from the scientific community and government agencies like Michigan’s Department of Environmental Quality. It is an emerging area of concern just beginning to be recognized, with many research projects going on at the federal level, said Richard Benzie of the community drinking water program from the Michigan Office of Drinking Water and Municipal Assistance. Included in the pharmaceuticals group are personal care products, like cosmetics and sun tan lotion, which also find their way into water sources, Benzie said. “I admit, I’m probably contributing to the concentration of Lipitor in the environment,” he said. However, the concentration of this cholesterol medication is very low. For a person to consume one dose of Lipitor, they would have to drink two liters of water a day for 1,721 days, according to the Alliance for the Great Lakes report. The Department of Environmental Quality reports that pharmaceuticals have been detected in ground water, lakes and streams. They can harm aquatic life, and scientists say damage to human health may become apparent in the future, or will become more likely as concentrations of medicine in the water increase, said Jim Sygo, deputy director of the Department of Environmental Quality. “Are we going to wait until it gets into the drinking water sources to deal with it, or start removing it in the waste streams?” Benzie said. Pharmaceuticals from human and animal waste end up in the water. And they get there when people flush unused medicines down the drain, something the EPA encouraged until the 1970s, according to Sygo. Pharmaceuticals have already damaged wildlife in New York, where birth control pills were linked to male fish developing female characteristics and becoming sterile, according to the U.S. Geological Survey. Standard water treatment plants are not equipped to remove pharmaceuticals from water. In fact, some drugs may become more dangerous during conventional treatment, according to a recent study led by Stuart Khan from University of New South Wales in Australia. Preliminary findings suggest that the pharmaceuticals change due to an enzyme reaction or interaction with bacteria. If the pharmaceuticals have an organic carbon base, then disinfection by chlorine could potentially create dangerous byproducts, according to Benzie, but there is no definite evidence of this yet. Even if small levels of dangerous compounds are created, it’s still up to the EPA to determine whether that danger outweighs changing the disinfecting process, which protects people from outbreaks of diseases like typhoid, Benzie said. Every five years the EPA identifies up to 30 compounds that have no drinking water standards. Then, the agency requires a statistically significant number of public water systems to track the identified compounds, over five years. When the results are in, the EPA begins the task of determining if there’s a health risk. Some studies say membrane bioreactors do a better job of removing medicines from water, Blair said. The plant can’t determine which pharmaceuticals it removes. That kind of research fits better in academia, Blair said. However, the plant does monitor compounds and elements like ammonia and phosphorous. “We’re all over that every day,” Blair said. A 2009 Associated Press investigation discovered that at least 41 million Americans drink water with detectable levels of pharmaceuticals. Often water reports do not reveal results of pharmaceutical tests, the investigation discovered. The federal government has no requirements about pharmaceuticals in drinking water. The EPA recognized the Traverse City wastewater treatment plant in 2007 for producing water that surpasses federal requirements. What about nannoparticles that are now becoming an untested part of our everyday lives? (i.e odor control socks, cosmetics and medical devices). If the treatment plants can’t get out the microscopic, then god only knows what we will all be drinking soon. Fantastic article. Really interesting and well written, might soon be a topic that all Midwestern will have to deal with in a few years with a growing concern for the environment. What is true is most water treated with chlorine is processed for chlorine. What is more difficult (expensive) is pulling salt out of water. The Blue Death sounds like an interesting study, since epidemiologists statistically correlate effects on environments from factors such as alien products in water supplies. I assume fertilizers have a far more direct impact on water supplies. This issue seems to be more pressing on society; and as I’ve learned, the overabundant planktivores in the Great Lakes as well. It’s a serious problem nationwide. Water quality needs attention. There is a very good book about the effects of unstable water supply from 2007 called THE BLUE DEATH by Dr. Robert Morris, a leading epidemiologist. Even long term exposure to chlorine has been linked to bladder and kidney cancer so you can imagine what a cocktail of pharmacecuticals and fertilizers (now leaching through the ground reaching streams and aquifers from use 20 years ago) could cause. Hello Love Canal. It would be good to know what cities have the other 34 membrane bioreactors. If my city doesn’t and I knew that, I could look for opportunities to press for it. A link in the article to this info would have been helpful. helping to keep our water clean.